This beautiful 18ct white gold diamond ring is set with a total of 0.35 carat of sparkling diamonds. The Forever Diamond has a unique flower cut made up of 73 facets, the result being exceptional sparkle and radiance. Perfect as a wedding band or eternity ring, this precious ring is finished with a hidden engraving of 'Forever', set with a single sparkling diamond. 18ct White Gold 0.35 Carat Forever Diamond Ring is rated 5.0 out of 5 by 2. 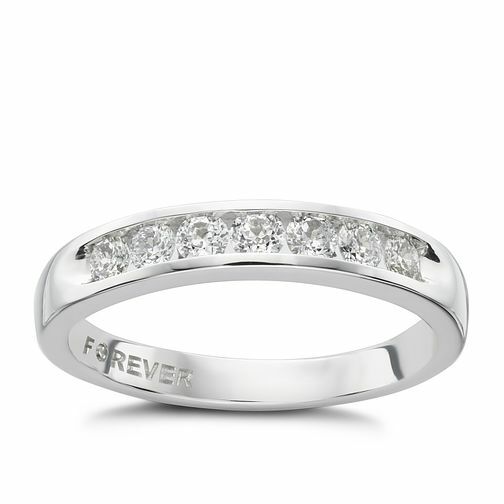 Rated 5 out of 5 by Anonymous from Ring for wedding I had been looking at this ring for my wedding ring for a long time so when it went in the sale I bought it straight away. It beautiful so delicate and sparkly and matches my forever diamond engagement ring perfect.